Crawford Wells the Sleep Shop, provides the backdrop for this summer scene offering bargains at their premises on the junction of School Street and Waterloo Road. Next door Albert Williams, in School Street, has just added a men’s hairdressers above this well established Wolverhampton men’s tailors. But Albert Williams will find he has more direct competition here at his new location than on Snow Hill where he was previously. Because he will now be in direct competition with arguably the current most popular gents tailors in town at this moment in time, just a couple of doors up from Crawford Wells in Darlington Street. I am talking about – Lou Bloom’s the top teenagers – Tailors who opened their Darlington Street shop in1954, when alternative choices of cloth, apart from grey flannel and blue serge; which had been the norm, we making their mark. 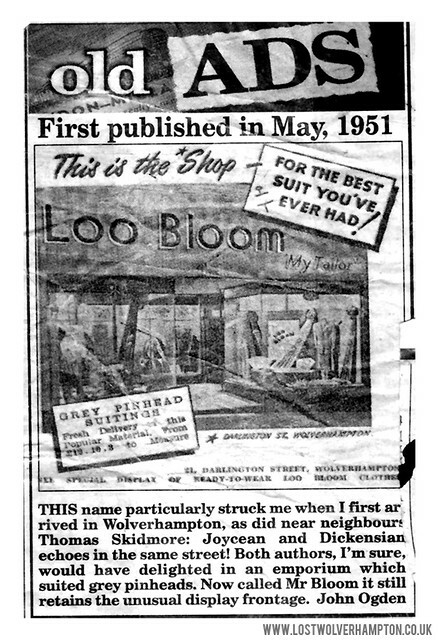 I am talking; Gaberdine, Sharkskin etc..
An old advert for Blooms Menswear that was reprinted in an Express & Star article. The girl I was engaged to at the time and eventually married worked at Beattie’s store, also in Darlington Street. To crown it all the ring I placed on her finger was purchased from Rudells, across the road from both stores. 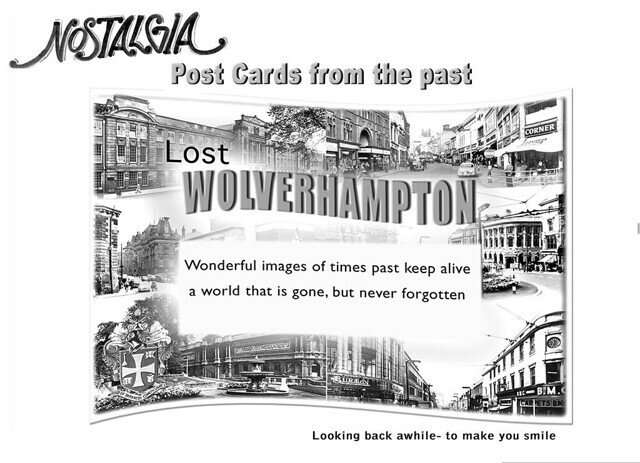 De-wirements were rare on the Wolverhampton system – But there weren’t many days went by in town in the early 1950’s when you wouldn’t get to see at least one set of trolley booms waving in the wind when they should have been on the wires. It appears here that the Conductor of Sunbeam trolley bus on the Whitmore Reans route whilst passing through the lights at the pre-sort junction on its turn from Darlington Street into Waterloo Road. Has let the trolleys to pass the junction and they have taken the wires on the Tettenhall route. 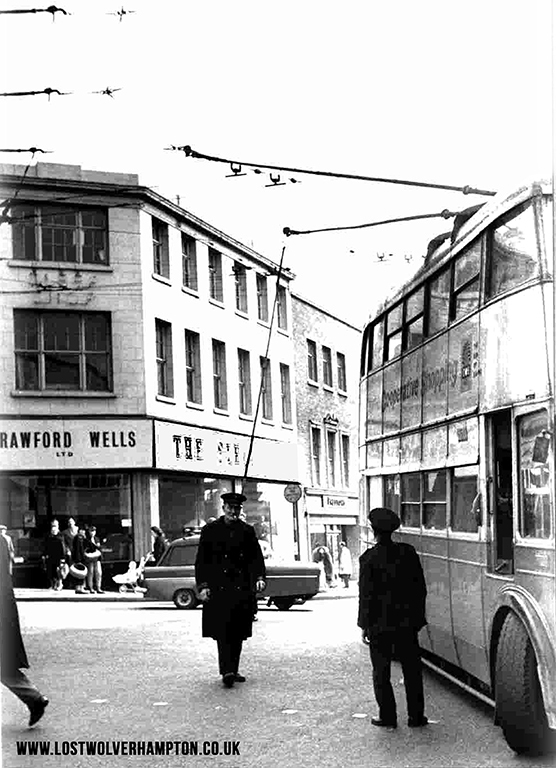 instead of the inside wires which would allow the bus to proceed on its journey to Court Road via Newhampton Road West in June 1963. Meanwhile, an inspector who is on hand moves across to chat to the driver obscuring the red-faced conductor who has retrieved the pole from beneath the bus and his transferring the erring pole. As the bus carried on down the Waterloo Road The conductor would have probably got some frosty glances from any Courtaulds shift workers in a hurry to get to the Hordern Road factory. Which we know dominated that area from the 1920’s till the early 1970’s.